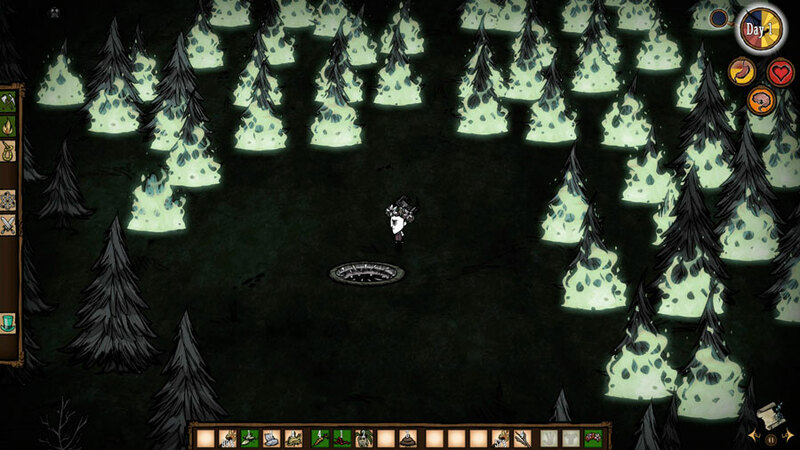 Don’t Starve is a harsh, survival indie roguelike with dark humor, a fairly unique visual style, and a pointed lack of hand-holding. You control a man named Wilson who suddenly wakes up in the wilderness, is told that finding some food before dark would be a good idea, and then… you are on your own. From there, the basic idea is to scrounge for some carrots/berries while using available materials to craft torches, tools, traps, and other basic gear as you do your best to survive in a world that wants you dead. Moving around and interacting with the world is surprisingly easy and intuitive. You can move around via left-clicking the ground/objects or by using WASD. Interacting with objects is done either with left-click or right-click. Pressing the Spacebar will cause your character to perform some context-sensitive activity, like start chopping a tree if equiped with an axe, pick up something if it is nearby, or attack an enemy. Combat is not particularly deep, but the “shallowness” combined with the roguelike nature of the game lends a tremendous amount of gravitas to battles. It reminds me of survival horror games that have clunky combat on purpose, to ratchet up the implicit difficulty. Don’t worry, I got this under control. The default game starts you in Survival Mode, which is really more of a Sandbox mode. While there is not really an “endgame” in this mode, the game’s structure naturally (and ingeniously) lends itself to a sense of progression and escalating danger. Establishing a base camp is pretty typical and allows you to stockpile materials and research structures, making the maintenance of your Hunger, Health, and Sanity easier. On the other hand, resources generally do not regenerate very quickly, which forces you to forage farther and farther from your base camp with each passing day. And ultimately, the arrival of Winter will stretch your capacity to survive to the very limit, given how traditionally easy sources of food dry up (plants don’t grow, ponds freeze over). This is on top of an escalation of random hostile encounters by the Hounds, or other boss-level mobs. Those in search of a more structured endgame can seek out Maxwell’s Door, a set piece randomly located somewhere on the map. Once entered, you are in Adventure Mode, tasked with surviving five randomly-determined theme worlds while collecting four Things in order to open the gate to the next world. Even if Don’t Starve consisted entirely of Adventure Mode, it would be enough to cover at least 20+ hours of gameplay. Especially given how the brutality of Survival Mode holds nothing to Adventure Mode worlds in which you are trapped in an endless Winter, or constant rain, or even a world with zero sunlight. I’m pretty surprised myself, actually. While I have been infatuated with Don’t Starve for quite some time, the game isn’t for everyone. Don’t Starve is extremely unforgiving, even in roguelike terms, where death is both easy to stumble into and results in a deletion of your save file. That said, while death is easy, it is almost always going to be due to mistakes you have made, rather than randomized deathtraps. Even if you get one-shot by a particular mob, that is only because you chose not to wear armor at the time, or because you were being reckless in not running away. Compare that to a game like The Binding of Isaac, where a white pill might randomly give a buff in one game and permanently reduce health in another. If you are someone willing to play and lose dozens of hours of progress in a roguelike though (or cheese the system via console commands or making backup save copies), I cannot recommend Don’t Starve enough. It has style, it has substance, and it is receiving developer updates every 3 weeks (at the moment). It is simple to get into, impressively complex when you start planning ahead, and always engaging while you struggle to survive. 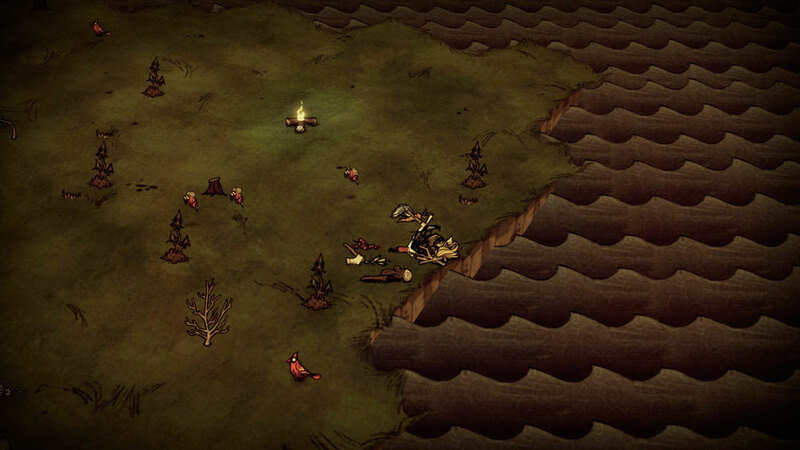 Posted on August 10, 2013, in Review and tagged Don't Starve, Indie, Review, Roguelike. Bookmark the permalink. 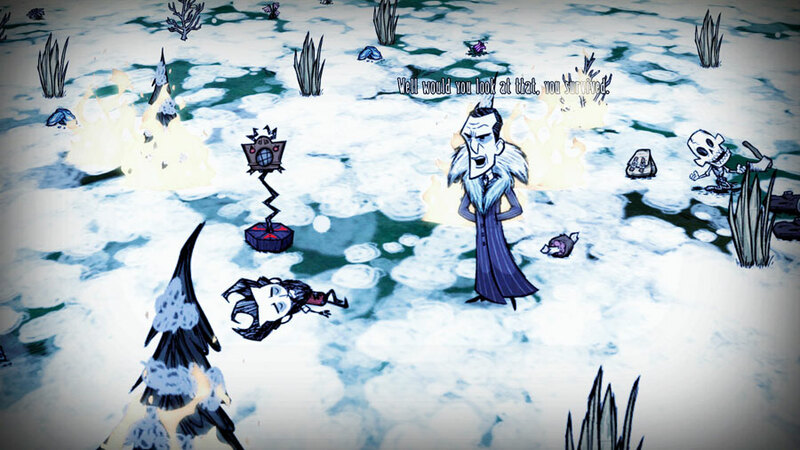 Comments Off on Review: Don’t Starve.